Waste is a growing problem whether it is contained in our expanding landfills, or scattered as litter found on land or in our water system. Petroleum based plastics can persist in the environment for hundreds of years. Plastic is a versatile product that has reduced the weight of goods transported throughout the world but not all products require the resilience of plastic, especially disposable items. Biodegradable plastics offer a solution to these problems by providing a light weight, semi-water resistant polymer that will degrade over time when exposed to microorganisms commonly found in soil. Solanyl Biopolymers are made from biological materials and decompose into biological materials leaving nothing behind except good nutrients to start the growing cycle again. Solanyl bioplastic granules are certified biodegradable and compostable according to the standards set by the European Union (EN 13432). How long will Solanyl Biopolymers last? Formulation used – different formulations have different shelf lives; some are more water resistant, some break down rapidly. Design of the product – thicker walled products break down slower. Environmental conditions – wet versus dry applications. 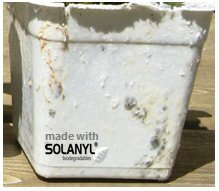 For example, plant pots made from Solanyl Bioplastic will last six months in greenhouse conditions if using the thin walled 4 inch pot, but will last 2+ years as a promotional item. We will help you determine the best formula to suit your application and product design.